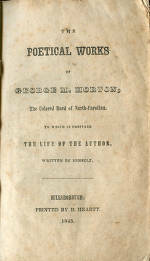 Despite Hentz’s sympathy for antebellum southern plantation owners, she encouraged Chapel Hill’s slave poet, George Moses Horton. He lived on a nearby farm, where his owner allowed him to visit the Chapel Hill campus to earn money composing love poems, usually acrostics, for students wooing their sweethearts. Eventually, Horton was able to live and work in Chapel Hill, where he hoped to earn his freedom. His poetry collection The Hope of Liberty (1829) is the first book published by a black southerner. Unlike the white writers of the day, Horton stresses the hardships of slavery and his longing for freedom. He published two other books of poetry and left the South for Philadelphia after the Civil War.